Awesome bull,, way to go. Right on! Great bull. Thanks for posting! Good job! Great picture, thanks for sharing. 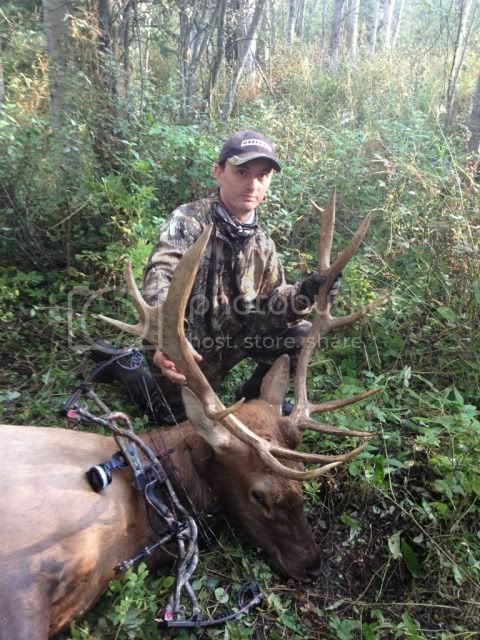 nice bull, thanks for the pics! Good job ! I still don't know how you bow hunters hold it together with a screaming bull coming into bow range. I shot my bull a couple of days ago at 8:00 am and had to bust my balls to get it out by myself but still managed to get it cleaned up and in the cooler by 5:30 pm. My wife needed the camera and I forgot to put it back in my pack in the morning so unfortunately no pics and at + 27 C I just wanted to get it out of the bush.